วันจันทร์ที่ 28 มีนาคม 2016 เวลา 05:13 น. The Deepwater Horizon drilling rig explosion refers to the April 20, 2010 explosion and subsequent fire on the Deepwater Horizon semi-submersible Mobile Offshore Drilling Unit (MODU), which was owned and operated by Transocean and drilling for BP in the Macondo Prospect oil field about 40 miles (60 km) southeast of the Louisiana coast. The explosion killed 11 workers and injured 16 others. 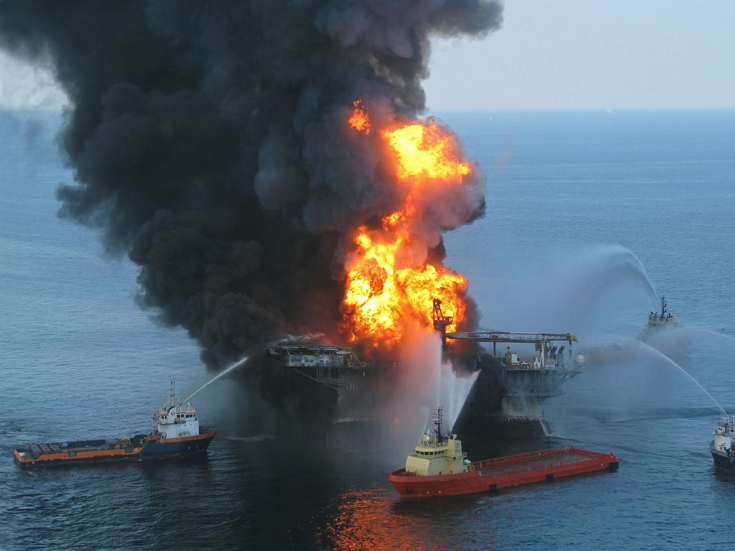 The explosion caused the Deepwater Horizon to burn and sink. The same blowout that caused the explosion also caused a massive offshore oil spill in the Gulf of Mexico, considered the largest accidental marine oil spill in the world, and the largest environmental disaster in U.S. history. Anchor handling tugs and platform supply vessels combat the fire on the Deepwater Horizon while the U.S. Coast Guard searches for missing crew. Deepwater Horizon was a floating semi-submersible drilling unit — a fifth-generation, ultra-deepwater, dynamically positioned, column-stabilized drilling rig owned by Transocean and built in South Korea. The platform was 396 feet (121 m) long and 256 feet (78 m) wide and could operate in waters up to 8,000 feet (2,400 m) deep, to a maximum drill depth of 30,000 feet (9,100 m). Press releases from Transocean state the platform had historically been used for deeper wells, including the deepest underwater gas and oil well in history at 35,055 feet (10,685 m) in 2009. The $560 million platform was built by Hyundai Heavy Industries in South Korea and completed in 2001. It was owned by Transocean, operated under the Marshalese flag of convenience, and was under lease to BP until September 2013. 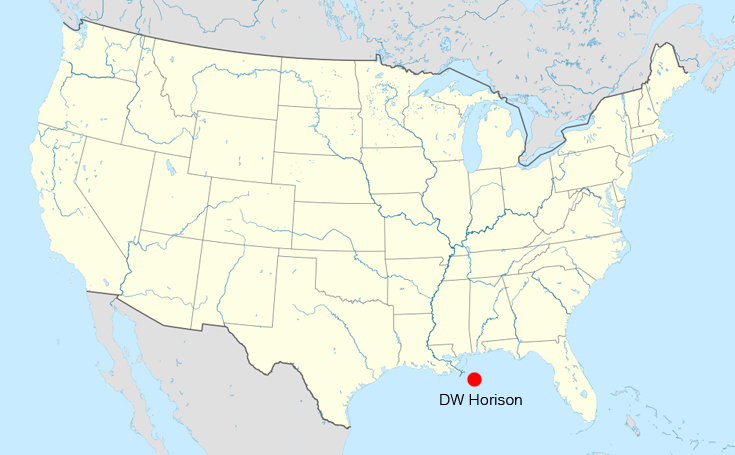 At the time of the explosion, the Deepwater Horizon was on Mississippi Canyon Block 252, referred to as the Macondo Prospect, in the United States sector of the Gulf of Mexico, about 41 miles (66 km) off the Louisiana coast. In March 2008, the mineral rights to drill for oil on the Macondo Prospect were purchased by BP at the Minerals Management Service's lease sale. The platform commenced drilling in February 2010 at a water depth of approximately 5,000 feet (1,500 m). At the time of the explosion the rig was drilling an exploratory well. The planned well was to be drilled to 18,360 feet (5,600 m) below sea level, and was to be plugged and suspended for subsequent completion as a subsea producer. Production casing was being run and cemented at the time of the accident. Once the cementing was complete, it was due to be tested for integrity and a cement plug set to temporarily abandon the well. 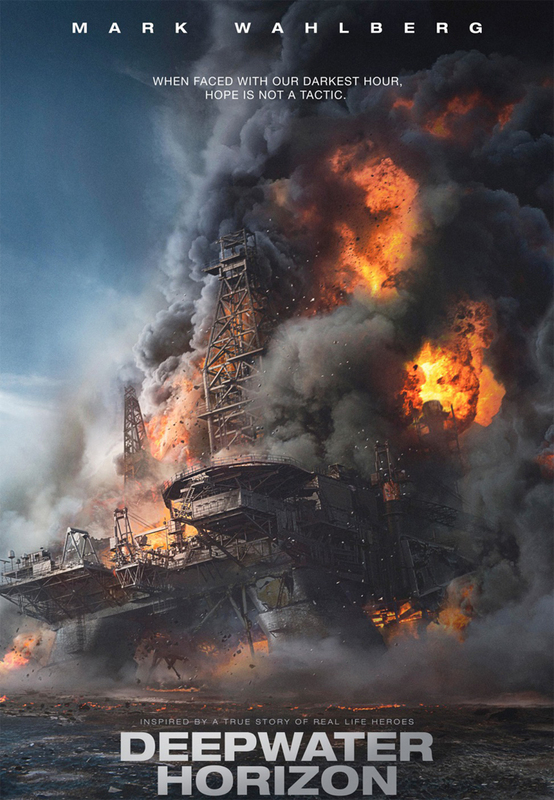 Deepwater Horizon is produced into Hollywood film directed by Peter Berg, written by Matthew Sand and Matthew Michael Carnahan, and stars Mark Wahlberg, Kurt Russell, John Malkovich, Kate Hudson, Gina Rodriguez and Dylan O'Brien. 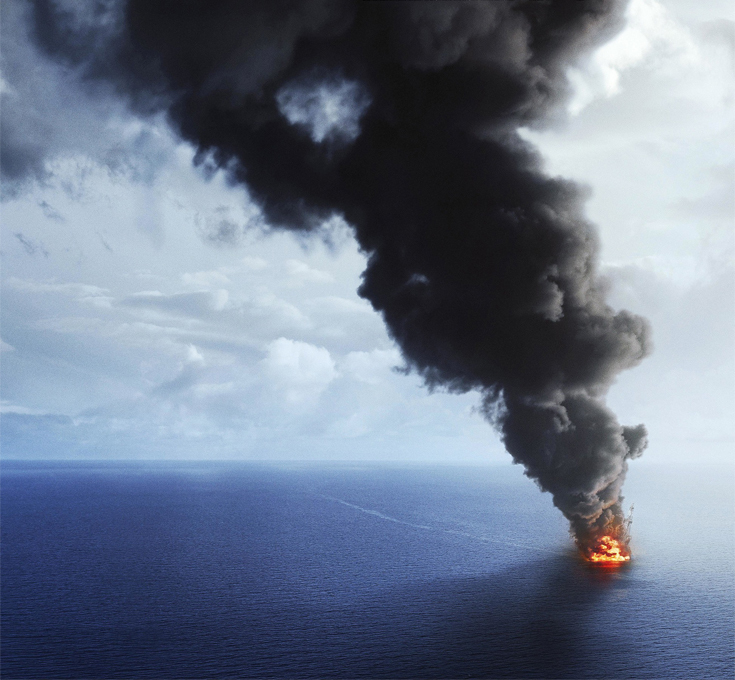 The film is based on the 2010 Deepwater Horizon explosion in the Gulf of Mexico. Principal photography began on April 27, 2015 in New Orleans, Louisiana. It is expected to release on September 30, 2016. Within days of the explosion on BP s Deepwater Horizon oil platform on April 21, 2010, as many as 25,000 scientists, oil experts, military and individuals with a vast range of experience in oil spills and their clean-up were assembled in the Gulf region to solve an expanding crisis that was quickly categorized as a Spill of National Significance by President Obama. 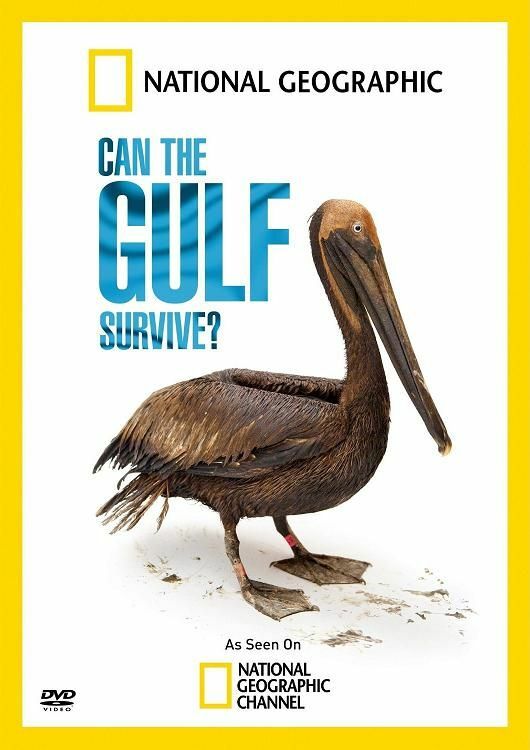 With startling imagery and intimate accounts, Can the Gulf Survive? chronicles the activities of a number of individuals taking part in the first response whose work and expertise is especially critical in stopping the spill at the well head and cleaning up its effects in the weeks and months that follow. It is really a great and useful piece of info. I'm happy that you simply shared this useful information with us. general things, The web site style is perfect, the articles is really great : D.
definitely you're going to a well-known blogger when you aren't already. up the nice quality writing, it is rare to see a nice blog like this one these days. hard to get that "perfect balance" between user friendliness and visual appeal. different subject but it has pretty much the same page layout and design. Wonderful choice of colors! in the article I browsed. And on this post Buddhist Monastery and Meditation Center in Thailand. I actually do have 2 questions for you if it's okay. Could it be simply me or does it look like some of these responses appear like they are left by brain dead visitors? :-P And, if you are writing on other places, I would like to follow you. Its such as you read my thoughts! You seem to understand so much approximately this, like you wrote the ebook in it or something. the message home a bit, but other than that, that is excellent blog. Hi there! I simply would like to offer you a big thumbs up for your great information you have here on this post. over the same topics? Thanks a lot! a year andd am nervous aboout switching too another platform. wordpress posts into it? Any help would be greatly appreciated! the inernet will be much more usefuhl than ever before. or even I success you get right of entry to persistently fast. a related subject, your website came up, it looks great. Hi there, just was alert to your blog through Google, and located that it is really informative. this in future. Numerous other people will be benefited out of your writing. Good post. I absolutely appreciate this site. Thanks! story. I was surprised that you are not more popular because you definitely possess the gift.